As autonomous vehicle companies launch family-focused public trials and automakers invest in “mobility solutions” instead of cars, we are entering an age where sharing a vehicle will likely become more popular than owning one. But that memo hasn’t really gotten to cities that continue to mandate outrageous parking minimums and the architects who obediently design gargantuan garages in response. A future that won’t require nearly as much space for storing our motionless vehicles opens up a whole realm of urban opportunities (not to mention environmental improvements). Which is why urbanists likes to focus on parking garages, the behemoth structures that take up space in our downtowns—often occupying desirable real estate that could be used for more offices, retail, or housing. 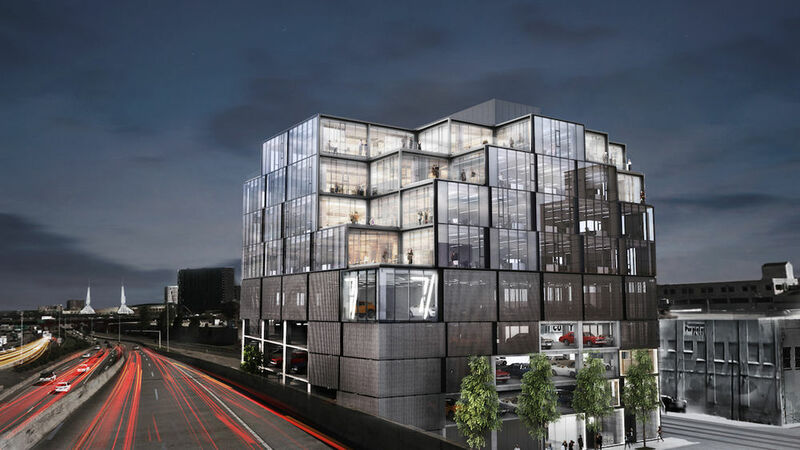 To illustrate the humble parking structure’s potential, Gensler designed a fictional LA cultural center—“The MOD”—which showcases how parking garages can be reclaimed as civic or public space. Please, note to several details that would allow The MOD’s parking structure to slowly transition over time from a place that only serves cars to one that serves people. The addition of knockout panels and modular sections make walls and ceilings easily removable, allowing light and circulation between levels. And garages can be outfitted with the proper amenities like utility hookups to prepare them for future workspace or retail uses. Gensler is also one of a handful of architecture firms that’s responding to the parking glut in the real world by designing flexible spaces that can easily convert into other uses. When Gensler designed the 84.51 Centre, for example, the three levels of parking were designed to convert to office space as needed. This meant creating a facade for those floors that matches the rest of the building. The design of the offices, pictured below, clearly maintains some of the architectural elements you might recognize from a parking garage, like the high ceilings and concrete columns. Today we sees an opportunity for developers to save money by anticipating these changes. For new buildings the requirements for parking are so great it can be a third of the construction costs. If developers are able to eschew the pricey excavation costs of cavernous below-grade garages, they can focus more on their above-grade floors. This will allow architects to build nicer buildings and interiors.